It's 'a retro cook' off and I am jumping in with a childhood favourite. To be honest, I feel like a bit of a fraud really...I'm not sure if 3 ingredients constitutes a recipe but I was raised on this stuff so here goes. 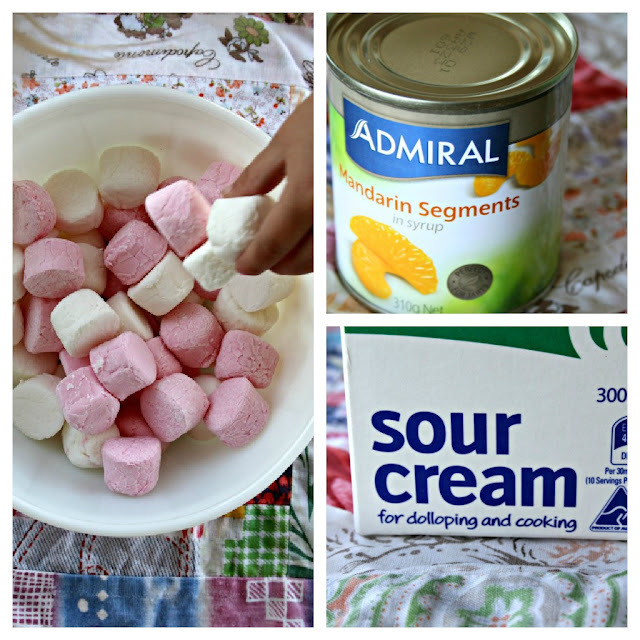 Combine sour cream and marshmallows. 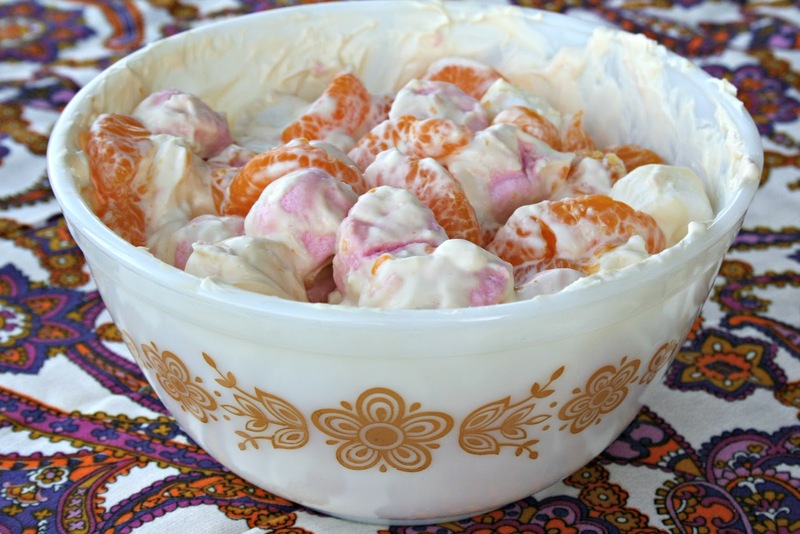 Drain mandarin segments and gently fold into sour cream and marshmallows. Refridgerate for a few hours. Serve chilled. My Mama usually whipped this up with a bbq. It was always served as a salad despite being more like a sweet. Have you ever tried it? Maybe you have your own version. Big thanks to Kylie and Donna for hosting the 'retro cook off'. Check out the smorgasbord here. It's absolutely delightful! I can't wait to try the Black Magic Chocolate Cake made with condensed tomato soup! I'm chuffed you joined us, although I cannot for the life of me get my head around your Mum's Marshmallow Salad! I just can't imagine what it tastes like*...such a weird combo. I guess that's what retro cooking is all about...weird combo's! *only one way to find out, right? I'm going to have to whip up this baby myself! Hi Lea, that one is a family favourites, I was going to add this to our cook-off list but could not find mandarin segments at our local shop. The kids ate the marshmallow instead :) Great fun! My mom made this for us! I remember the oranges and marshmallows. And I remember liking it. 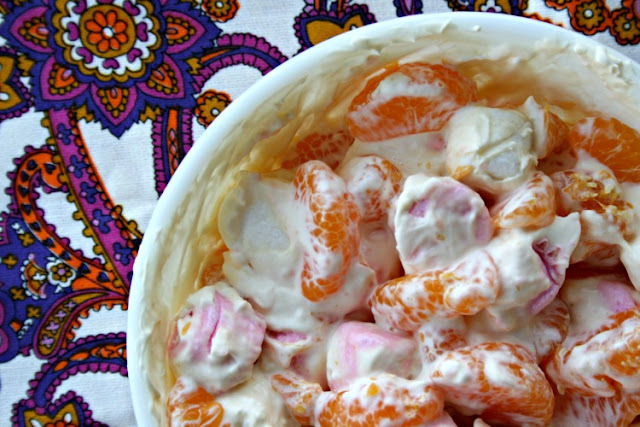 I have a secret passion for mandarins in cans, so I suspect I'd wolf this down (not so sure about the marshmallows though!). Fantastic "salad"! eeeeew! sorry Margie, none for me thanks! I am SO tempted to try this (and a little afraid). It's a dotty kind of day!